Jerry Weinberger is Professor of Political Science at Michigan State University. From 1997 until 2001 he was Chair of the Department of Political Science. He received his B.A. from The University of California at Berkeley in 1967 and his Ph.D. from Harvard University in 1973. He won the Michigan State University Teacher-Scholar Award and has twice been a Senior Research Fellow of the National Endowment for the Humanities. In 2007 he won the MSU Distinguished Faculty Award. He is Director of the LeFrak Forum and Co-Director of the Symposium on Science, Reason, and Modern Democracy. Professor Weinberger has pursued a career-long interest in the relation between modern politics and the rise of modern science and technology. He has written extensively on the seventeenth century philosopher and statesman Sir Francis Bacon and more recently has lectured and written on the emerging subject of biotechnology. Professor Weinberger is also interested in the political thought of Martin Heidegger. 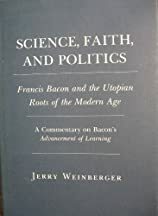 Among his books and scholarly articles are Science, Faith and Politics: Francis Bacon and the Utopian Roots of the Modern Age (Cornell University Press, 1985); “Politics and the Problem of Technology: An Essay on Heidegger and the Tradition of Political Philosophy” (American Political Science Review, March 1992); “Technology and the Problem of Liberal Democracy “ in The Problem of Technology in the Western Tradition, ed. Melzer, Weinberger, and Zinman (Cornell University Press, 1993); Francis Bacon’s History of the Reign of King Henry the Seventh: A New Edition and Interpretive Essay (Cornell University Press, 1996); and “Pious Princes and Red-Hot Lovers: The Politics of Shakespeare’s Romeo and Juliet “ (The Journal of Politics, 2003). His latest book is Benjamin Franklin Unmasked: On the Unity of His Moral, Religious, and Political Thought (The University Press of Kansas, 2005, 2008). He also writes occasionally for City Journal.